If the announcer isn’t there telling the crowd what to look for, there’s no way they’ll get it. Take John Mohr. 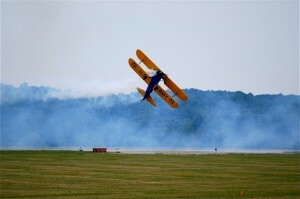 He rolls a stock Stearman inverted low to the ground. He holds it there until the engine sputters and eventually quits from fuel exhaustion. 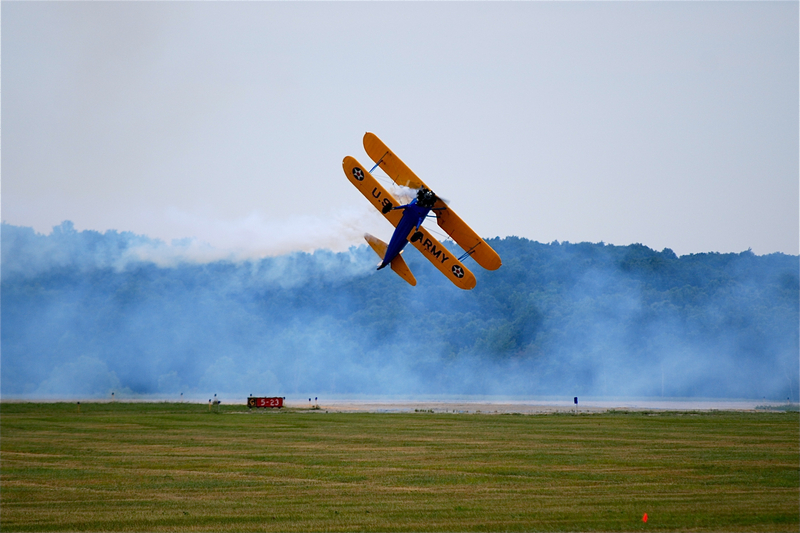 The Stearman has a very slow roll rate. If John doesn’t do a lot of things right – and immediately – he’ll make contact with the ground inverted in an open-cockpit aircraft. He has to know without a doubt that he can get the aircraft rolled upright in time to either get the engine restarted or land on the wheels. Greg Koontz takes off in a Super Decathlon with less than 200 hp. He rolls it inverted immediately after takeoff and climbs out inverted. It takes huge skill and guts to do that. It also hurts to do outside stuff like that. And Greg does it in an aircraft with less than half of the horsepower and other performance capability of other performers. If an announcer doesn’t tell these things to the crowd, you can easily imagine how much of these acts would be wasted. Probably the second most memorable thing that airboss Ralph Royce says in his briefings with performers is that the audience will likely be amazed even if all you do is take off and fly upside down. He recommends in no uncertain terms that, if a maneuver could be replaced with another maneuver that is simpler and easier and that the average member of the airshow crowd would like just as much, you should replace the hard maneuver with the easier maneuver. The audience just can’t tell the difference. None of this means that you can’t do anything fancy or difficult or that you can’t include a maneuver that only an aficionado or IAC judge would appreciate. But, if you do, you’re going to need somebody to tell the audience why your maneuver is cool or what they should learn from it or why they should get excited about you as a performer because if it. I’ve been to enough Airshows by now that I’ve heard my share of both really good and really bad airshow announcers and narrators. And I’ve experienced airshow acts with no announcer or narrator. 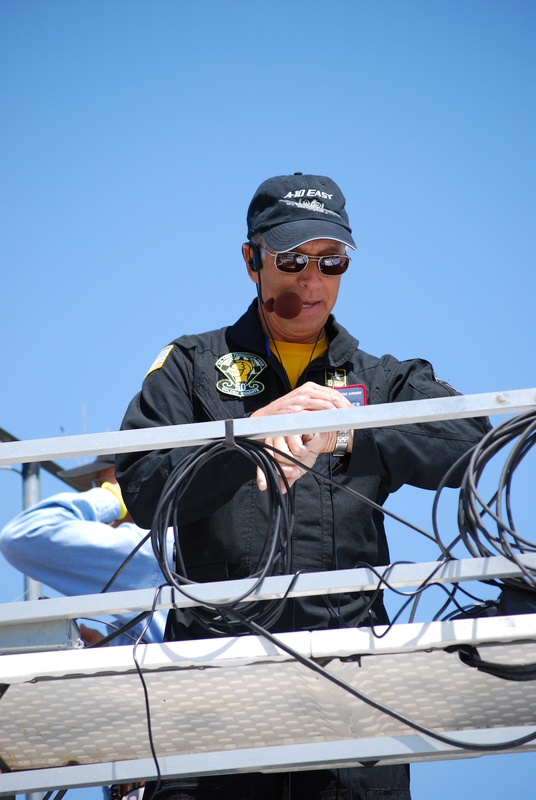 I’ve come to know some of the voices that you’ve heard at airshows near you. I’ve developed a friendship with announcer and narrator Matt Jolley, whom many of you know best from Warbird Radio. I’ve flown with the Thunderbirds’ narrator, then-Maj Tony Mulhare. I had Rob Reider here on Airspeed recently. I’ve begun – or at least I think I’ve begun – to understand what works and what doesn’t. I think that I might even have something of what it takes to be a pretty good narrator. I’ve been running at the mouth about aviation since 2006. Before that, I was a part time radio DJ in the mid-1980s, and a double-ruby debate and forensics participant back in high school. (I made at least one girl cry in each of my first two debate seasons. I did not mean to, but there it is.) And I’m a lawyer who has to talk and think on his feet for hours at a time. So, after casting around a bit, I came up with the obvious. Many of you know that the Tuskegee Airmen National Historical Museum, in addition to operating the TG-7A motor gliders that I fly, has an airshow team that flies three-ship demos in the aircraft. These are all-metal Franken-gliders with motors in them and the Tuskegee name on the fuselages that are flown by guys who definitely aren’t Tuskegee Airmen themselves. They’re – um – too young to be Tuskegees. Frankly, my team has explaining to do. The team needs an excellent narrator. So I arranged to accompany the team to the Battle Creek Field of Flight Airshow and Balloon Festival and serve as team narrator. Not every team brings a narrator. Many let the airshow announcer do the narration, either from a script or general notes. Others bring along someone specific. 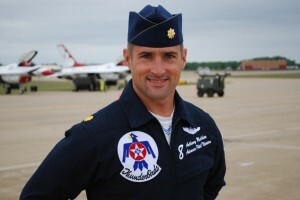 The Thunderbirds and Blue Angels usually have the advance pilot do the narration. 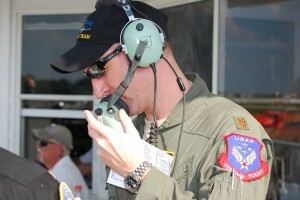 The TAC DEMO teams usually have one of the enlisted crew do the narration. Mike “Bloke” Robinson has narrated for the Black Diamond Jet team, which makes it really interesting as his English accent isn’t necessarily what you’d expect. Sometimes performers’ spouses narrate. Some, like the Geico Skytypers and Kyle Franklin, have used pre-recorded narration on a CD with backing music and the tech person simply advances the track on the CD at the right time. I’ve even seen iPad soundboards used. It’s a mixed bag. Some do a great job and really make the performance special. Others really don’t do much more than give the main announcer a break. 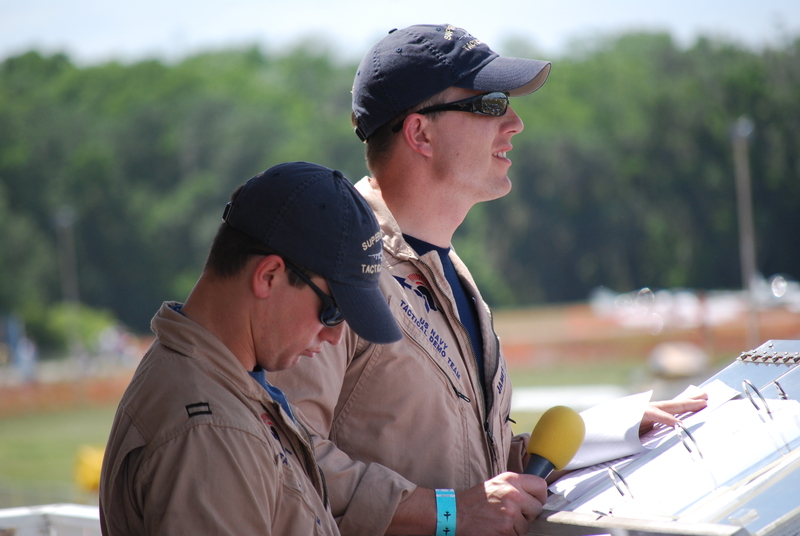 Although performer narrators and airshow announcers do similar things, they’re not the same. They’re different species of the same genus. An announcer is there on the mic for the entire show. Even during the breaks in flying, the announcer is usually there at the stand. Beyond the commentary associated with the actual flying, the announcer serves some other important purposes. The announcer handles lost child announcements, logistical stuff (like traffic outflow information), scheduling (such as whether and to what extent events like an evening balloon launch or fireworks are likely to happen, given the weather and other circumstances), and safety and emergency messages, such as when a thunderstorm or other factor could cause injury or worse. The announcer also has something called the Last Page. It’s a page in the announcer’s binder that has an outline of the things that need to be said if something really bad happens. Usually items like turning kids away from the sight if it’s particularly disturbing, remaining calm and staying where you are as long as there’s no danger, clearing ingress and egress lanes for emergency personnel, and things like that. If you’re a narrator and one of your team members augurs in, your job is to shut up, hand over the mic to the announcer, and walk away. A good announcer will already have your mic potted down and be talking to the crowd before you realize what’s going on. Crowds are wonderful things for which to perform and in which to be if you’re experiencing a performance. You can feel things in a crowd that you can’t feel by yourself. Did Peter Frampton ever record Do You Feel Like We Do in the studio? I don’t know and I don’t care. And neither do you. The only thing that matters is that it’s on Frampton Comes Alive and that it’s a bad idea to be on the road near me when the climax of that performance comes around on the iPod in the car. Hint: All four limbs are required to do the drum part and the drum part is duly and energetically played with warranty-voiding passion. Crowds intensity a performance. But that same quality can make crowds strange and wild things, too. They are not only much more than the sums of their parts. They are utterly different from their parts. I’ll never forget a particular lesson that I learned about crowds. In the early 1980s when I was 14 or 15, I was Joe Boy Scout. I’ve been to Jamboree ‘81, I’ve been to Philmont – the whole shooting match. I worked staff at Camp Greilick near Traverse City, Michigan for a couple of summers tying knots and building rope bridges and taking groups of scouts out into the wild to survive on nuts and berries. Bill Ewing was the voice of the Jesse Besser Lodge, the huge dining facility at the camp. He held the mail call. He read the required information (no, I’m not going to say the “A” word), and he led the songs from Junior Birdmen to Father Abraham to The Titanic. It’s a demanding gig to keep a few hundred kids from age 11 to age 17 occupied, amused, and well-behaved. I know because I did it for a couple of weeks the next summer and nearly lost my voice. Bill was super-human. Summer camp is a separate reality, divorced from the outside world. Universes come into existence on Sunday evenings, inflate, spawn entire civilizations, laws of physics, and histories, then collapse back upon themselves by noon the following Saturday. The monologue of a camp experience doesn’t need to have anything to do with the outside world. The Clean Table Award was what you’d think it was. At the end of each meal, each table of scouts cleaned up its table as best it could. Bill walked around to judge the tables. The award went to the cleanest table in Besser Lodge for that meal. For whatever reason, competition was fierce. Scouts would wipe down their tables aggressively and stack their plates, cups and tablewear in designs of spectacular intricacy at the end of the spotlessly-wiped table. It escalated. One troop snuck in mess kits from which to eat, then hid the mess kits in their shirts or sat on them so that, when it came time to judge, the regular plates, cups, and tableware sat at their places, clean and unused. One troop actually managed sneak its table out of the dining hall entirely and strike poses mime-style around the non-existent planar surface when Bill walked by to judge. The Clean Table Award was evidenced by an old cast-iron frying pan that had developed a pronounced crack. Someone had painted appropriate designs and lettering on it. Bill awarded it to the cleanest table at each meal. The scouts at that table them carried the pan around with them until the next meal. As will happen with any sufficiently powerful totem, someone decided that it would be a great idea to steal the flying pan from its winners and then to ransom it. This happened early in the week several times. A careless Tenderfoot would leave the pan on a stool at the archery range, then turn around to fine it gone. A patrol quartermaster would take it to the waterfront for a swim class and fine it gone when he returned from the water. It became contentious in the extreme and it wouldn’t surprise me if matters had come to blows on at least one occasion. It was late in the week. Probably Thursday. It was lunch. The tables were clean. Bill walked solemnly around the hall, hovering the pan over various candidate tables as the assembled hundreds cheered or booed their approval or disdain. With a “thunk,” Bill placed the pan on a table, which promptly erupted in cheering. Then it happened. Two scouts sprang to the table. One grabbed the pan from in front of the recently victorious tablemates. The other ran interference as both scouts zig-zagged across the dining hall among the shocked and momentarily motionless hundreds. Out the side door they went and disappeared from sight. Time stopped. Every eye in the place was fixed upon the doorway. Then every eye slowly swiveled to Bill, still standing by the now-empty table. Every head leaned toward the side door. Every knee bent to spring. Every sinew pre-strained to leap. You could actually hear hearts beating. It would have been so easy for Bill to just say “Get ‘em!” It might even have been fun. But it also would have meant hundreds of children crashing headlong toward a door too narrow to accommodate more than two at a time. And there were tables and chairs and glass windows on the way and near the door. And a really good chance that ambulances would have been involved before it was over. As quickly as the tension had attached to the room, it dissolved. Or at least no tide of olive green and khaki was going to sweep disastrously to one end of the hall. Bill saw the crowd as an animal different from the fun-loving individual boys. And he instinctively said words that turned the beast back into the boys. Bill Ewing went on to West Point and then commanded tanks in the Army. There is no doubt in my mind that the Army was right to place the trust of command in him. He had it in spades, even at 17. All of the really good announcers have that. The ability to be the voice of the experience and to maintain order and safety and to mediate experiences good and bad. Add to this weighty responsibility the sheer volume of work that happens on a given airshow weekend. Take a typical Saturday for Phil Dacy at Battle Creek. He had to be at the briefing at 0830, be on the mic beginning around 1000, begin announcing acts in earnest between 1100 and 1500 or 1600, then hang around and narrate the twilight show at 2100 and the balloon glow at 2200. That’s a 15- or 16-hour day by the time you cover travel time, logistics, and administrative stuff. Most days aren’t like that, but an announcer can usually expect to be working between 0800 and 1600 on most practice or show days. And huge parts of that involve talking more or less continuously. That might sound easy to you, but it’s not. Try talking out loud for just an hour or so. Just read the phone book out loud. If you’re not used to it, you might find yourself becoming hoarse in as little as 10 minutes. And, unless you’re Dave Grohl or Henry Rollins, you need to pace yourself even if you’ve been at it for years. I’ve alluded before to the difficulties of getting around at airshows. 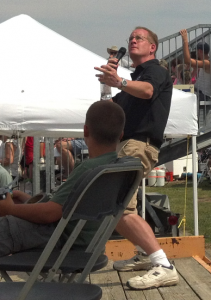 At many shows, there’s no clear and easy way to get from the staging area to the announcer’s stand. At Battle Creek, the crowd is southeast of Runway 23R between Taxiways G and E. If you’re staged at Duncan Aviation or Hangar 1 (toward the departure end of Runway 23R near the Taxiway D intersection), you take the “cheater route.” It parallels Taxiway C, which itself parallels Runway 23R. At the tower, you veer right because the crowd line is set off 500 feet from Taxiway C.
I had a media pass and a crew pass, but those only cover the person, not the person’s vehicle. On a couple of occasions, I managed to get one of the volunteers in a golf cart to take me from Duncan to the announcer stand, but I realized pretty quickly that that might not be as reliable as I needed it to be. After all, those folks have more to worry about than getting me from place to place. So I elected to do some social engineering. I wondered what would happen if I simply acted as though I was supposed to be driving a Ford Escape around in an active airshow box on my way to and from show center. Of course, this involves actually driving a Ford Escape around in an active airshow box and admits of no half measures. My Ford Escape is like any other black 2010 Ford Escape Limited. Except that mine has large magnetic decals on the sides that say “Airspeed Crew Vehicle.” And, for this particular drive, I added the triangular “Danger – Ejection Seat” decals on each door (complete with ‘Rescue” arrow pointing to the door handle). And, for good measure, a rubber-chicken pitot tube cover over the antenna. Thus equipped, I pulled out onto the cheater route and, several minutes later, I arrived in front of the announcer stand with no chaffing about the wrists. Or ankles. I resolved to leave the vehicle there for as long as possible to give the local constabulary plenty of opportunity to see it there and get used to its presence. At some shows, you’re cheek-by-jowl with the air boss, often sharing the same elevated platform with him at show center or further out toward the performing aircraft. At Battle Creek, the announcer and the sound system operator have their own platform a few hundred yards southwest of the air boss trailer down by the hot ramp. So, if you want to know what the air boss is doing, you can’t just overhear him next to you. You have to listen to the radio or just keep your head on a swivel. The narration for Team Tuskegee had to take into account several factors. The team would open the show as the very first act at around 1100L. Thus, my audience would be the airshow faithful who had been at the gates an hour prior to opening, together with a smattering of families who had arrived for the carnival and the midway and might be diverted to watch the team if the narration caught their attention. The TG-7As don’t look like any other aircraft. They’re yellow and have huge wingspans. And there are three of them. So that’s an advantage, but you have to explain to the audience why different equals cool. You also need to explain things like the 180 aborts that 3 does and explain why it’s cool that Lead and 2 are up there in the box with their engines off. Lots of backstory and you have to get it across in an entertaining way so you can get the audience excited about what it’s seeing. With this in mind, I climbed up onto the announcer stand and said hello to Phil Dacy. I set up my paper notes and my iPad with the background information and then instantly figured out that there was no way I was going to be able to organize everything in an intuitive way. The paper seemed most helpful, mainly because the sun was glaring off the iPad. The iPad was readable, but required me to huddle over it while still keeping the microphone close to my mouth. And that also meant that I couldn’t keep the team in my field of view while reading from the iPad. I also realized that trying to listen to the boss frequency while narrating was going to be way too distracting and would probably end up putting the radio speaker too close to the mic in the first place. Phil pointed to a cordless mic and told me that it was mine. I picked it up and made ready. I settled on a system where I held the radio to one hear listening to the boss frequency and held the mic in my other hand, ready to take the throw from Phil and start talking. As soon as the team was cleared for takeoff, I planned to put down the radio, start talking, and pick up my notes. No such luck. 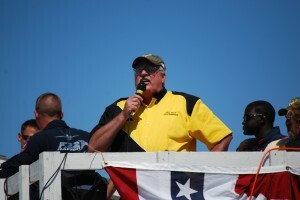 The team rolled into position on the runway and the taxiway off to the left and Phil announced that the airshow was underway and that the next voice that the audience would hear would be Steve Tupper of Team Tuskegee. I did the stupid thing that all new radio guys and announcers do. New radio guys and announcers instinctively fear silence. Silence can be uncomfortable. It can kill momentum. It can also build tension and be a powerful tool. But mostly it’s uncomfortable. And you’ll say the stupidest imaginable things in order to relieve that discomfort. I immediately began talking and promptly blew through lots of the interesting stuff I had to say before the team was even in the air. But, after they got up and began to climb for the racetrack passes, I hit a stride. Whenever an aircraft approached show center, I’d talk about it. Whenever the same thing had been going on for awhile, I’d switch over to the background narration. It got easier when 3 started his series of 180 aborts. The aircraft was closer to the crowd and it was actively performing maneuvers. And then, as Lead and 2 shut down the engines, I used a thing that Jack Hodgson suggested – just shutting up and letting the audience listen to the silence of the gliders coming in. Here’s a montage of what I said and how I said it. 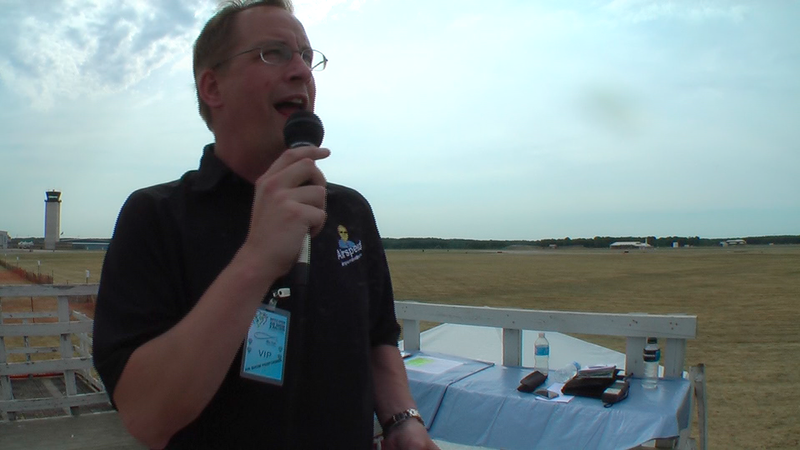 I did the narration three times, the last two being full-up demos in front of airshow crowds. After the last one, I watched the team rise up and head over the horizon for home. Since that weekend at the Battle Creek show, I’ve narrated for the team at Manitowoc, Lost Nation, and Pontiac. And I’ve been the co-announcer at Pontiac in 2012 and the Gathering of Warbirds and Legends in Topeka this summer, and did my first gig as the sole announcer at Pontiac a few weeks later. And I developed an even deeper appreciation for what you have to do as an announcer. Especially where you have to be ready to narrate for the performers who don’t have their own narrators and do a convincing job of it. I know aerobatics about as well as any relative newcomer to the sport. I’ve probably flown more acro than many announcers. But I can tell you that, even as an acro pilot, without more preparation, the only four or five things you have to say about an acro demo will come out of your mouth in the first 60 seconds of the first performer’s demo, leaving you with nothing to fill in the remaining part of that act or any subsequent acts. The third time you find yourself saying “there goes Bobby Boffo pulling up, up, up into the vertical!” you know that you’re behind your mental power curve and maxing out your verbal AOA. Or you might be pretty sure that something’s going to happen, but you want to be sure of it before you say anything. Jim “Fang” Maroney ends his demo in his Super Chipmunk by unstrapping and flying a pass standing up in the cockpit. In order to get set up for that, he flies outbound and then brings it back in, having set the trim carefully and done whatever else he needs to do to prepare for the pass. That understandably takes some time. It’s been a really aggressive and close-up acro sequence up until now, but then the pace just drops to nothing. You’re there with the mic in your hand while he’s two miles out and getting ready to turn inbound. If you don’t keep the energy up with your commentary, it’s going to dull the impact of the last pass. It’s a really cool pass he’s about to do, but you really want to be sure that he’s actually going to be standing up in the cockpit before you tell everybody about it. In addition to stumbling into learning experiences, I went to Rob Reider and Hugh Oldham to ask advice, especially about Last Page items. I picked Matt Jolley’s brain about pacing. I picked Mike “Bloke” Robinson’s brain about timing and rehearsal of your music and speaking cues. I found the community of announcers and narrators to be warm and open. If the masters ever snub the apprentices or the journeymen, I’ve never seen it happen. And the more you understand the skill that it takes to do what they do, the more amazed you become about how willing they are to share their experience. I’ve also noticed that there’s a camaraderie among announcers, narrators, and others who do more talking than flying. They have a much broader sense of how the act looks and how the crowd reacts. They’ll bend over backward to help give suggestions to performers and make the airshow experience as exciting as possible. And, for all the seriousness and responsibility, narrators and announcers have a sense of humor to which you need to pay attention if you’re a performer. From the awards presentations at the ICAS Convention to conversations during a weather hold to a song shared among friends. And some mischief. By way of just one tiny example: It’s a good idea to be nice to your narrator. I’ve already talked about how a narrator can make your performance. This same skill makes you as a performer very vulnerable up there in the box. I’m not suggesting that I’d ever stoop to such behavior or that anyone else I know would do so. I’m just sayin’. Be nice to your narrator. So, only halfway through the season, I had spent time out at show center blowing up stuff and I had talked about things I love with a mic in my hand, aircraft in front of me, and an airshow crowd behind me. I had begun to understand that even these experiences just scratched the surface of what it is to be part of an airshow. And, unknown to me at the time, it was all about to go to another level entirely.